All baptized Christians are welcome to receive communion at Christ Church. All of the Sacraments and Pastoral Offices are fully described in the Book of Common Prayer. The Episcopal Baptism service is found in the Book of Common Prayer, page 299. Baptism is the rite of initiation into the Christian community, what St. Paul calls “the body of Christ.” Baptism may happen at any age. We welcome all inquirers to contact the parish office about this important step of incorporation into the life of the Church. A preparation class for parents and sponsors is required. Holy Communion at Christ Church is open to all baptized Christians. Come forward either to the rail and kneel, or to the right or left of the rail and stand. Place the palm of one hand in the other to receive the bread. Receive the wine by guiding the chalice to your mouth. If you prefer not to receive wine, cross your arms in front of your chest. Wait until the person to your left has finished receiving before leaving. Parents are asked to assist their young children in receiving the bread and wine. Non-baptized persons are invited to come to the rail for a blessing. To inquire about preparing children for receiving Holy Communion, speak to our clergy. Confirmation is making an adult affirmation of faith, and through a bishop’s laying-on-of-hands, to embrace the presence of the Holy Spirit in one’s life to guide, comfort, and empower us for a life of Christian service. At Christ Church we provide an opportunity for young adults to affirm their faith and deepen their connection to the Church beginning in Sunday school. Confirmation typically happens around age 16-17, following completion of our two-year preparation course. Adults may be confirmed at any age. The requirements are that you have been baptized and desire to follow Christ in an intentional way. Inquirers should speak to our clergy. Those previously baptized and confirmed in the Roman Catholic, Orthodox, or Lutheran churches need not be confirmed again; they may instead be “Received” into the Episcopal Church as those who have already experienced the laying on of hands by a bishop. Confession (Reconciliation of a Penitent) is available by contacting our clergy. Confession is especially appropriate during penitential seasons like Lent. A general Confession is part of our regular Holy Eucharist service. The Episcopal marriage service is found in the Book of Common Prayer, page 435. Thinking about being married at Christ Church? If you haven’t yet worshipped with us, we’d love to see you on a Sunday morning, and have you speak to one of our clergy following the service. A discussion with our clergy and review of the Episcopal wedding service will help you decide if Christ Church is the right place for you to be married. A minimum of six months notice is suggested, and completion of pre-marital counseling is required. In case of illness or injury, notify the parish office as soon as possible. Prayers for healing are offered at our worship services and by our prayer team. You may want to be included on our prayer list. The Episcopal service for Burial of the Dead is found in the Book of Common Prayer, Rite I page 469, Rite II page 491. All baptized Christians are encouraged to plan for a funeral service in the church. Whether simple or elaborate, depending on one’s wishes, it is an important opportunity to care for those who are bereaved, and for the gathered community to celebrate the gift of the departed one’s life. Caring for, commending to God, and celebrating the life of one who has died is an important ministry of the Church, and an opportunity for us as Christians to embrace the promise of resurrection. We encourage all Christ Church parishioners to make funeral plans long before they will be needed. It is a great help to your family, your clergy, and those who will be left to have instructions of what you want. When a member of your family or a person for whom you have responsibility has died, contact the parish office. In the ideal situation, the clergy will have been notified earlier of an illness or life-threatening situation in order to provide pastoral care and guidance to the dying and their family. Christ Church clergy will also conduct funeral home or graveside services for non-members; contact the parish office. Christ Church has a beautiful marble columbarium inside our small chapel, which is in the front left of our church. It is as sacred and serene resting place for the departed’s cremated remains. 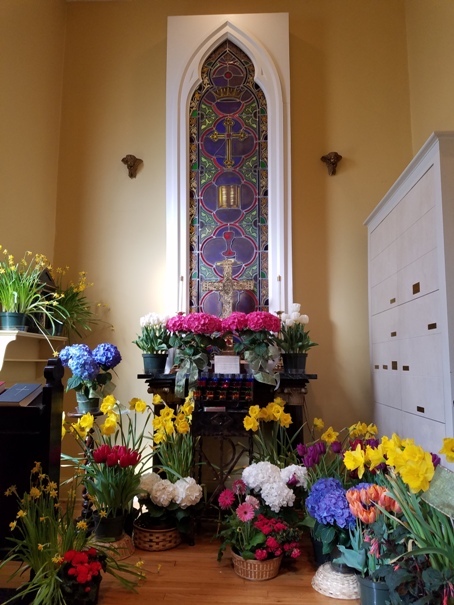 To inquire about purchasing a niche in our columbarium for yourself or a loved one, contact the parish office.